On my first trip to Jing Fong I intended to focus on vegetable dumplings but wasn’t particularly successful, it turns out they have stopped serving steamed vegetable buns and only have one vegetable dumpling. Meat filled dumplings seem to be their strength, so I decided to return and indulge. 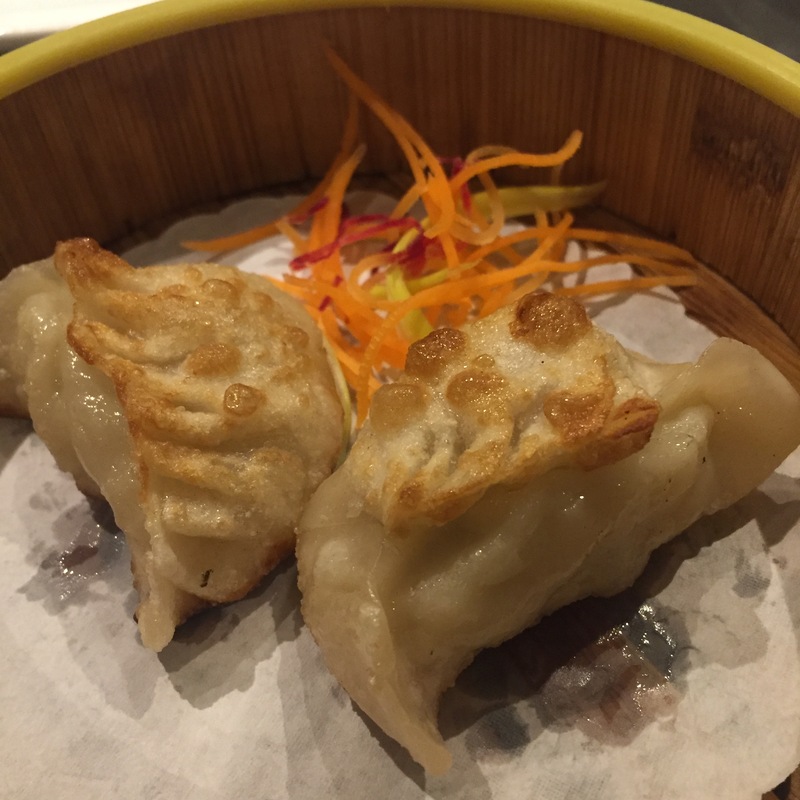 – Pork & Vegetable Dumpling. This was one of the best plates of pan fried pork dumplings I have eaten in a long time. The wrappers were thin and delicate, like Japanese gyozas, and crispy golden fried on two sides. The pork filling was immaculately seasoned, so it was salty, savory and pork flavor-full. The dumplings are served with threads of carrots which are really besides the point. These dumplings, in servings of two, are on the happy hour menu, and I ended up getting three orders. Although they are listed as Pork & Vegetable on the happy hour menu, they also have shrimp mixed into the filling. – Roast Duck and Asparagus Dumplings. 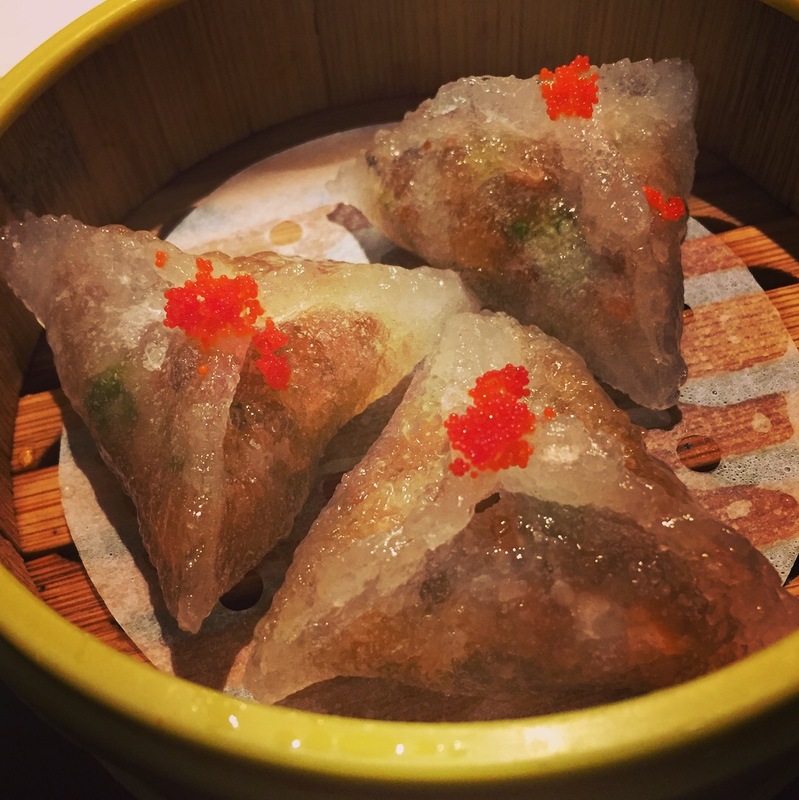 These are steamed, triangular, rice flour wrapped dumplings adorned with fish roe. The duck had a deep, rich, sweet and smokey flavor and meaty chew that I really enjoyed. The dollop of fish roe on top of the dumplings provided a salty, brine punch, but I didn’t really see what the asparagus in the filling added. These dumplings were pretty big and the rice flour wrapper made them a little hard to pick up with chop-sticks. Despite my rave in my last post about Jing Fong’s rice flour wrappers, the wrappers on these dumplings were a little problematic. – Pork Shumai. 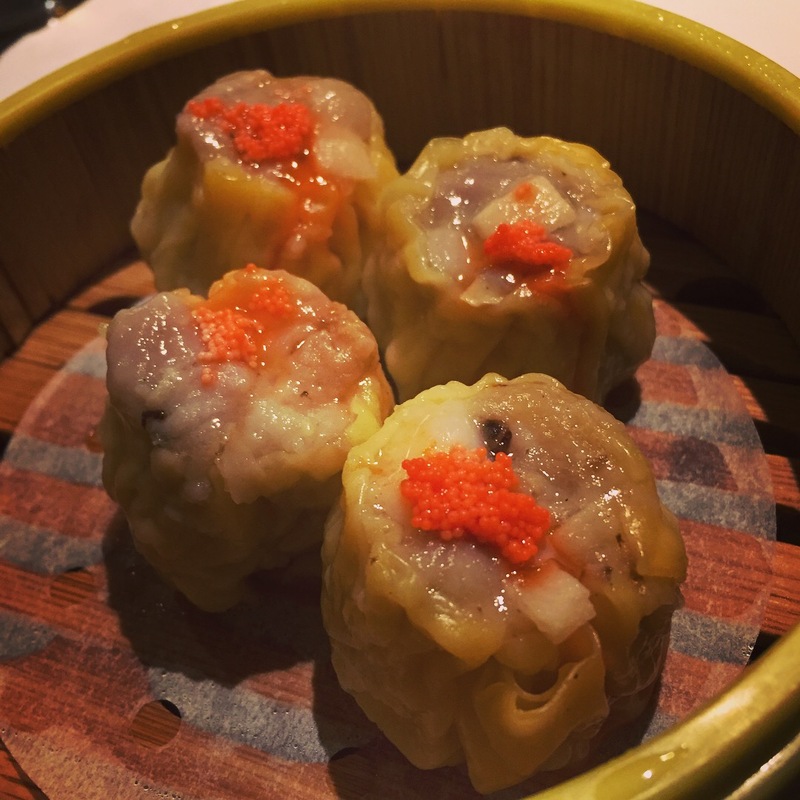 The pork shumai are tightly wrapped and filled with pork and water chestnuts and are topped with fish roe. This was another excellent steamer of dumplings, the chopped water chestnuts provided a crunch that balanced the soft chewiness of the steamed pork filling. The pork was well seasoned with a deep savory porky flavor and the roe provided a hit of salty brine. I used a mix of Chinese mustard and Hoisin BBQ sauce as a dipping sauce for the Pork and Vegetable Dumplings and the Shumai, the hit of mustard to the back of the palate went really well with their pork. For the Duck and Asparagus dumplings I mixed some Sambal chili paste with soy sauce. This entry was posted in Duck, New York City, Pan Fried, Pork, Shumai. Bookmark the permalink.